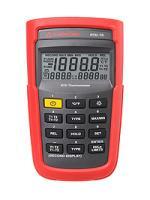 Product Description: The RTD-10 Dual Input Digital RTD Thermometer is preferred for industrial process applications. It typically provides higher accuracy then thermocouples and maintains stability for many years. Resistive thermal devices (RTDs) are becoming the preferred temperature sensors for precision industrial applications. Instead of generating voltage, RTDs generate electrical resistance, which varies linearly with temperature. Amprobe RTD thermometers maintain long-term stability for superior repeatability of measurements, when compared to thermocouples. Weight: Approx. 285.76g (0.63 lb) including batteries and packaging box.